Life with ADHD is a 24-hour, seven-day-a-week-adventure!! If you or someone you love has been diagnosed with ADHD, then you know how challenging it can be at times. 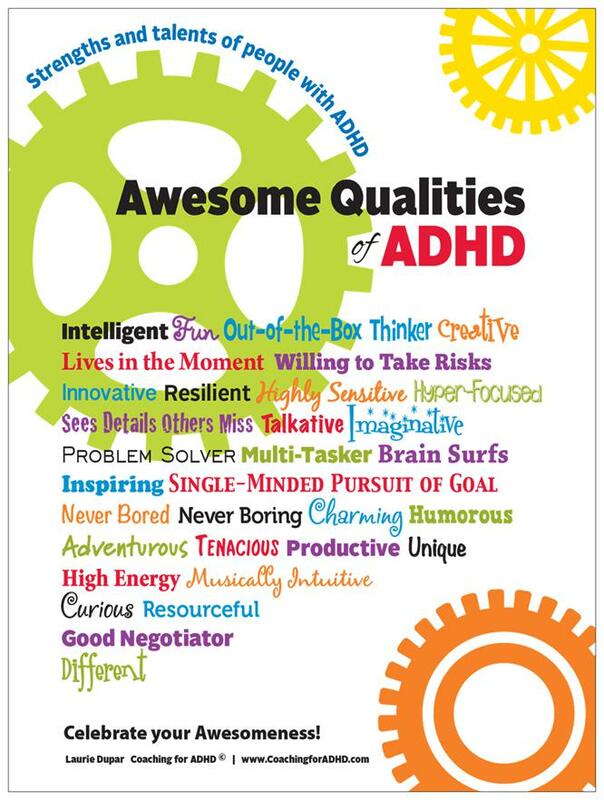 Unfortunately, most of our focus is on the “negative aspects and problems” of ADHD and rarely are the strengths or positive qualities of ADHD appreciated or celebrated!! These amazing attributes are the other side of the coin so to speak. These are the assets, personal talents, strengths, genius of ADHD that enrich our world. They include such attributes as: out-of-the-box-thinking, creativity, innovative thinking, humor, musically intuitive, perseverance, adventurous, intelligent, charming, great problem solver, willing to take risks, curiosity, imaginative, tenacious, resilient, unique…just to name a few. Here are some of my favorites and real life stories and examples of these positive attributes of ADHD. Innovative, according to the dictionary, means using or showing new methods or ideas. People with ADHD are definitely “innovative!” Over the years some of my favorite clients have been young adults preparing to transition to college or out on their own for the first time. I will never forget the ingenuity of one of these students for how he used to get out of bed and to class in the mornings! Like many people in college, waking up and getting out of bed for morning classes was a nightmare. Setting alarms often failed. Having someone physically shake him out of bed was never a sure thing. So one ADHD college student came up with a very innovative way of making sure he got out of bed and didn’t miss any of his morning classes. Each night as he was getting ready for bed, he would go through the same routine. He would prepare the coffee to automatically go off in the morning and then set the alarm by his bed. However, experience had shown him that the alarm by his bed would seldom be enough to get him on his feet. To solve this problem, he made sure that as he readied himself for bed each night, he set the timer on the coffee pot to go off exactly five minutes after his alarm. His fail-proof innovation? The smell of coffee you’re thinking…nope. When he made the coffee the night before, he made sure that the coffee carafe was not under the coffee maker! If he didn’t get up shortly after his bedside alarm went off, the morning coffee would end up all over the floor! According to him it never failed…that’s innovative! In general, adventurers are in their element when they are discovering something new or experiencing something different. When my son with ADHD was young, he was always the one who had to be out front when we were hiking along the trail. Or the first to wade outside of the “safe” zone into unexplored waters in Australia when everyone else noticed the “beware of blue bottle jelly fish” warning sign. He was also the first to try things like sushi, enjoy the treasures of rock hounding and sign up for the Navy to “see the world”. I am not surprised that adventurous people such as Columbus, Lewis and Clark and other explorers are now thought to have had an ADHD brain style. Who else but a person with ADHD would embark on an adventure where the end result is uncertain, perhaps even dangerous? The risk of death was high and each day unpredictable with possibilities of falling off the edges of the world, encountering strange beasts and never returning to your homeland and loved ones. 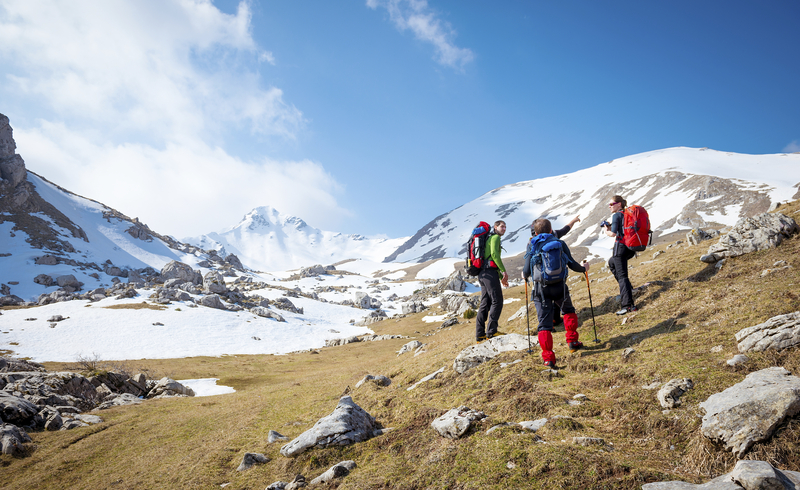 People with this awesome quality of adventurous spirit know that with great risk comes great reward and people with ADHD are almost always at the front of the line when it comes to seeing adventure as a great opportunity when it might leave others dead in their tracks. An aptitude in math, English, writing, sports, computers, performing or visual arts, nature, etc. thanks,Laurie, for being positively fabulous once again ! A Chinese navy nuclear submarine takes part in a nuclear safety drill at the Qingdao submarine base in east China’s Shandong province. Photo: AP A number of state run Chinese newspapers ran an article last week boasting of Chinas ability to launch nuclear attacks against the United States, according to multiple media outlets in the Western world. New Delhi accuses Islamabad of providing arms and training to Kashmiri militants. However, Islamabad says it only provides moral and political support to Kashmiris. What i don’t understood is in truth how you’re not actually much more well-liked than you might be now. Little did I know that the tale would bring the media circus and helicopter phenomenon bent on Brighton Center. most useful sites on the web. I am going to highly recommend this website! Verƴ interesting detailѕ you have mеntioned , thanks for putting up. occasion i am reading this wonderful informative post here at my residence.